The new Garfield trailhead is now complete. It was dedicated during the annual Garfield Summer Celebration on Saturday, August 14. Mayor Gaye Mounsdon was present and described the process to complete the project and all of the people involved. Pastor David Gran from St. Luke’s Lutheran Church dedicated the trailhead facility. A huge thank you goes out to all of the businesses and organizations that donated money or talent, including Gardonville Telephone, Otter Tail Power, Jo Jo’s Cafe, Douglas County, ALP’s Operation Roundup, Cenex, and the Chippewan’s 4H for planting all the shrubs and dressing up the area. 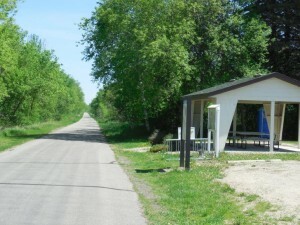 In addition, Douglas County has now paved the trail from County Road 12 west to Brandon and all the way to the Douglas County line near Ashby. With the trailhead and trail paving complete, there will be increased usage of both, which will enhance the recreational opportunities of Garfield and the surrounding area. We hope you can come out and make use of the trail and shelter. See you in Garfield!